National Inspire Your Heart with Art Day! That’s today! Listen here about my recent experience at the Fort Wayne Museum of Art as I celebrated today, albeit, a bit early! 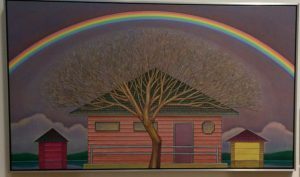 The photos posted here are mentioned in the audio and I’d like to add one that was my favorite: a piece by John Hrehov titled, “After the Flood.” The rainbow drew me across the room to take a closer look, then I noticed the dark sky behind it. There is fear in that background–for physical safety, of the unknown, and representing the dark and painful times in our lives. 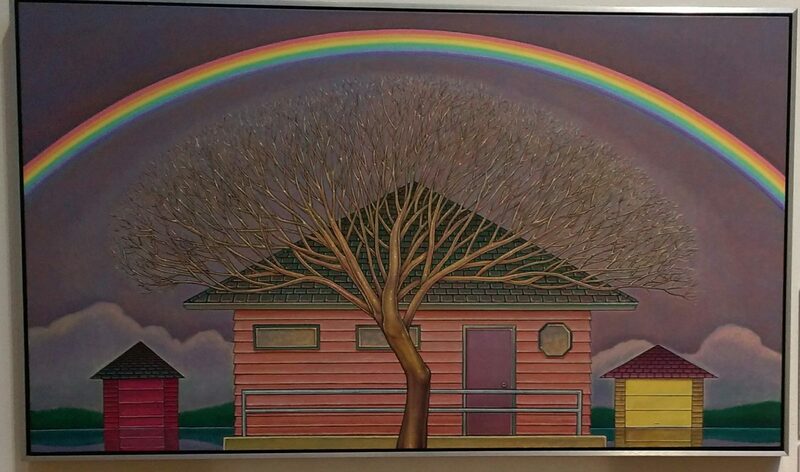 And then there is the strong house, the sparkling tree, the hopeful rainbow. I could look at this for hours. Hope you are able to inspire your heart with a good book, some unique and favorite music, artwork, creating art, . . . maybe your own visit to a museum or gallery! Whatever you choose, I hope you are inspired! Although I didn’t celebrate on the day of your post I did enjoy time with watercolors & filled a few more pages in my mini sketch book. My work will never hang in a museum but it is in my heart & I thank God for the joy of creating it & hearing the crinkle of the dried pages as I look back over the fun ideas He gave me.